Christmas is just around the corner which means spending a lot of time at shopping mall doing last minute shopping for their loved ones and at the same time at home while gaining that “holiday weight” during the well-celebrated week-long holiday. 1. Working at home means avoiding holiday traffic. Christmas is a worldwide holiday, and that means people who celebrate it will do the same thing which leads to being sandwiched on the street, also doing last minute gift and grocery shopping. If you go to work, chances are you’ll be stuck in traffic. But if you start working from home, chances are you will save more cash from cutting the expenses of commuting via public transportation or gas money for a privately owned vehicle. Also, traffic can be quite a hassle especially during the holidays: more people are on the streets carrying big shopping bags or people rushing to the next big sale. 2. Working at home leads to being more productive. Clearly, there are a lot of job opportunities online that will help you discover your hidden talents and skills, or pursue the job you always wanted to do. Apart from this, you can actually start to enroll in new classes and get academic help to broaden your knowledge. 3. Working at home is more accessible during Christmas. Though working in the presence of others can help you with your social skills, working at home is not so bad. Working at home means you can wake up at any time you want without jeopardizing a deadline. Especially during Christmas time, you would want to spend it with family and loved ones. You hold your own time You can work in your pajamas You can utilize your time working and pursuing other projects You can use social media while working without anyone judging you. If you plan on starting your own company, even if it’s Christmas time, you can absolutely do it without the hassle of renting your own space. At the same time, your employees can also enjoy time working at home and spending time with their respective loved ones. 5. Saves you money on office snacks. Ever wondered where a sizeable percentage of your daily budget is consumed? It's probably spent on food. 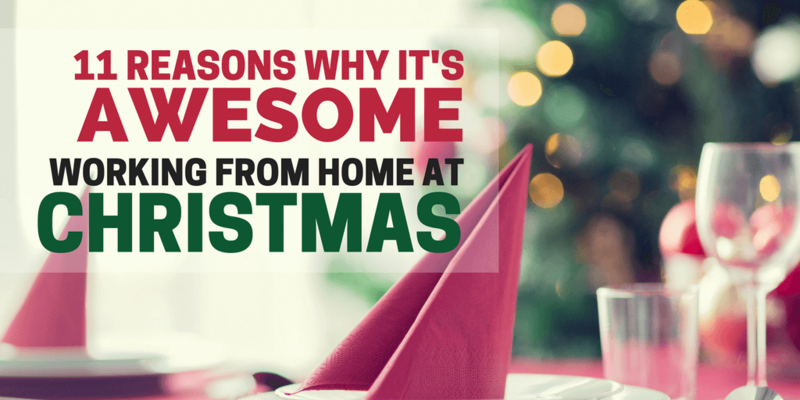 That’s why working from home this Christmas season comes with a lot of perks. You can enjoy your mom’s dishes while working You won’t have to pay for office snacks You won’t have to prepare your office lunch You won’t have to spend your lunch money dining out. 6. You don’t have to be present at meetings. There comes a time in every employee’s life where they just want to finish their daily task and not be troubled of attending meetings, which are sometimes proven to be useless. Working from home means cutting all the meetings, and just attending them in front of your laptop with a webcam. 7. Your colleagues or employees from other companies will be jealous. After all, it’s Christmas! This is a holiday best spent with your loved ones and working seems unreasonable. But imagine working while at the same time being with family? It’s definitely a win-win situation for you and your employer. 8. Working from home is like working on a vacation. You don’t have to call in sick because you are already at your home, well-rested and ready to take on more jobs. You can even actually go on an actual vacation with your family while working because all you need is a laptop and a strong internet connection. 9. You’ll be happier working from home. Working from home is can definitely help improve your work-life balance. You will have time to actually get on with your personal life You will have money when working at home You can meet up with your friends during the Holidays without thinking of unfinished office deadlines You can invite friends over for Christmas dinner while working You have all the time to do whatever you want And the best part, you are actually at home. 10. Home is where the comfort is. Do you hate your office desk? Or jealous of the people having fun outside while you are there, stuck in the office doing nine to five? Nothing can give you more comfort than the goodness of your home. You can throw your legs up without looking unprofessional and you can sit on a more comfortable couch eating your favorite Christmas pie. 11. You can insert time for fitness. Most people including myself, gain weight during the Holiday season. But working from home during Christmas means eating your favorite dishes and avoiding the scary holiday weight because you can work out to lose what you have gained during this season while earning money. Christmas is a holiday and a cultural and religious event celebrated that celebrates the birth of Jesus Christ. It usually happens during the 25th of December and is celebrated worldwide. 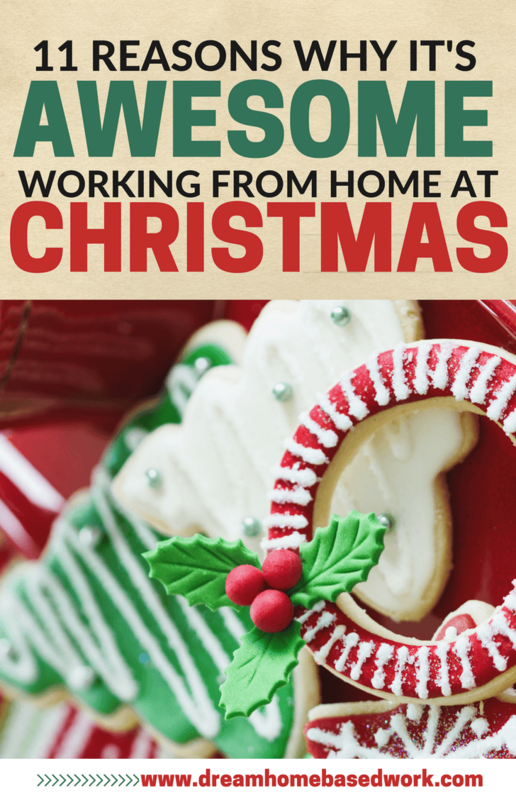 Clearly, working from home during the Christmas season is mutually beneficial for both employees and employers. This is the time to actually spend more time with your family while earning good cash. Kerry Creaswood is a successful writer and blogger. Her topics of interest are blogging, SEO and marketing. To find more about Kerry – check her Twitter.